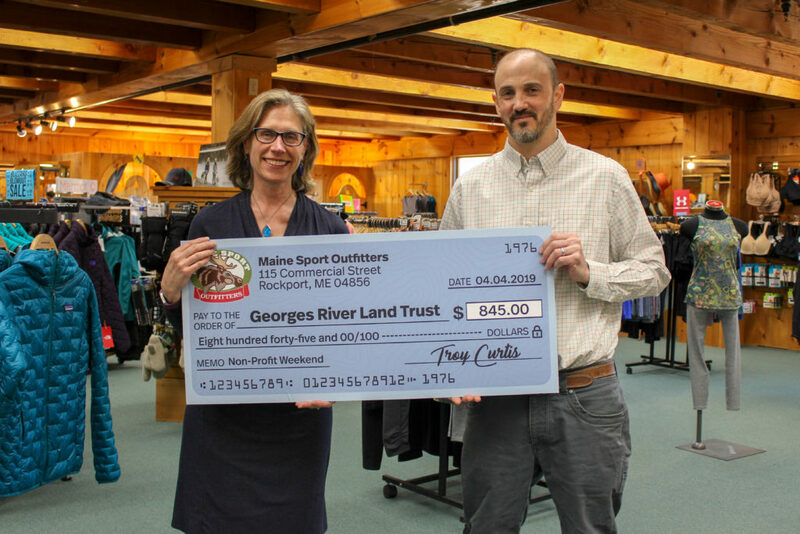 Georges River Land Trust was recently the beneficiary of a weekend partnership with Maine Sport Outfitters in Rockport. The Land Trust had an information table set up in the store on March 22, 23, and 24, with information about our trails and preserves, and a special drawing for one lucky winner to enjoy a 4-person guided river paddle later this year. We also presented two talks: one by author and hiker extraordinaire Carey Kish on his recently-published 11th edition guide to Maine trails, and the other by Executive Director Meg Rasmussen on the Georges River Canoe Trail. Both talks were well-attended. Laura Wiltse-Tibbitts of Waldoboro won the drawing for the paddle, and Maine Sport donated 5% of their gross sales for the weekend to Georges River Land Trust. That’s store manager Troy Curtis handing over the big check to Meg Rasmussen. Thank you, Maine Sport!